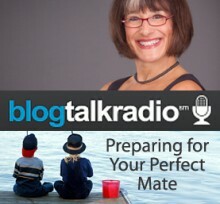 You can prepare for your Perfect Mate? Yes! Hear Cindy speak on October 1st at 4pm in her ongoing radio series on BlogRadio with Zurriane. Preparing for your perfect mate is all about your relationship with you. We will talk about the Law of Attraction and that your perfect mate may have been presented to you many times, but you just couldn’t see them. Cindy will lay out the 10 easy steps in this illuminating broadcast. It will transform your life! Listen to the October 1st broadcast here.